If you want to set the default YouTube video quality while playing content online, then you have to configure independent settings for mobile devices like Android phones or tablets and for a Desktop or Laptop browser. You cannot exactly specify the default quality like 360p, 480p or 720p to load every time you try to watch something. But you can instruct the YouTube app to limit mobile data usage and instruct the website to never play higher-quality videos. When you choose to stick to lower quality videos, you save precious bandwidth that is consumed by online media. This helps you to not get over your mobile bandwidth limit or preserve your downloads if you are on a limited connection. It also helps to load videos more smoothly on slower connections. 360p and 480p videos are still watchable for a lot of us, right? The settings that you have to commit to make sure that YouTube loads lower quality videos are different for the official Android or iOS application and a desktop browser. For the official YouTube mobile application, currently, all you can do is choose a default playback quality for the current run. At first, it loads the auto quality that is best for your device’s screen resolution. You can then switch the quality and the change will stay for the rest of the videos that you watch. It helps you to save your mobile data and prevents you from going over the limit. But once you quit the app completely by swiping it away or after you restart your phone, it will again begin to choose video quality based on your phone’s screen resolution and internet connection. Tap on a video and it begins to play. Tap on the three dots options menu present on the top right most corner. Tap on the gear icon that says Quality. Tap on your desired Quality like 480p. 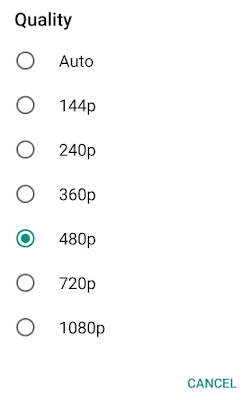 Once you do it, all the videos that you watch during the current run will load at 480p. There is an additional setting in the mobile app, which can help you save your data. You can use it to stream HD videos only over Wi-Fi. In YouTube app, click on the options menu (three dots when not playing a video). In Settings, tap on General. Makes sure the option Limit mobile data usage (Only stream HD video on Wi-Fi) is turned on. The slider should be on the right. The first thing that you have to make sure is that you are logged into YouTube using a Google account. Only then will your quality settings be saved. Otherwise, the website will try to load the best type of quality for your connection. So, create a YouTube account if you don’t have one. On the top right, click on your profile picture (if you have one). Click on the gear icon that says YouTube settings when you hover over it. From the links in left, click on Playback. Under Video playback quality switch to the option that says, I have a slow connection. Never play higher-quality video. Now, when you access media from your desktop or laptop, YouTube won’t load HD content that is 720p or above. For me, it usually streams in 360p.